Wolves defender George Elokobi will leave the club at the end of the season after the League One champions said they will not offer him a new contract. The 28-year-old joined the club from Colchester in January 2008 and scored four times in 103 appearances. But he has played only nine times this season and last appeared off the bench in January's 3-1 win over Bristol City. During his time at Molineux, Elokobi also had loan spells with Nottingham Forest and Bristol City. Cameroon-born Elokobi was spotted by Colchester while playing for non-league side Dulwich Hamlet. Two of Elokobi's four Wolves goals came against Manchester United, including the equaliser in their 2-1 Premier League Molineux win in February 2011. However, his time at Ashton Gate was restricted to just one game after he fractured and dislocated his ankle on his debut against Leeds in September 2012, ruling him out for the rest of the season. 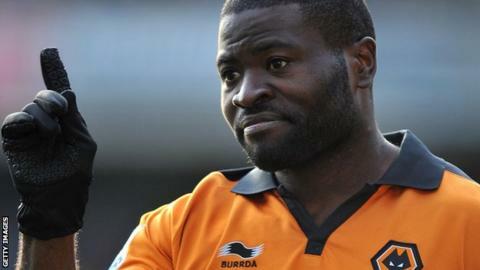 That was the second serious injury of Elokobi's career after he damaged multiple knee ligaments during Wolves' 2-0 win at Ipswich in August 2008, keeping him out for much of their Championship-winning campaign. "George has been a fantastic servant to this club since his arrival in 2008, proving to be a hugely popular figure with team-mates, staff and fans alike," Wolves chief executive Jez Moxey told the club website. "He's been a constant figure throughout the club's promotion to the Premier League and our three-year stay in the top flight, with one of his most memorable moments being his goal against Manchester United at Molineux. "He has battled against some serious injuries but he's never been let his head drop and his attitude, commitment and character throughout adversity has been infectious and an example to everyone."